Serving as the secretariat of the University of Tokyo’s academic membership in the International Telecommunication Union’s Telecommunication Standardization Division (ITU-T, Headquarters: Geneva, Switzerland), an international standardization organization. Since 2012, the III has been serving as the secretariat of the University of Tokyo’s academic membership in the International Telecommunication Union’s Telecommunication Standardization Division (ITU-T, Headquarters: Geneva, Switzerland), an international standardization organization. In addition, the III has also joined ETSI and 3GPP, which is the most influential organization in the international standardization of mobile communications. Through these memberships, we have been striving to contribute to the standardization of academic research results. Particularly regarding the ITU-T, a signing ceremony was held on the Hongo Campus on March 12, 2012 to mark our university’s accession to membership. On this occasion, we also hosted a lecture by Mr. Malcolm Johnson, former Secretary General of the ITU-T. 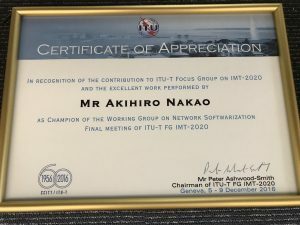 In activities conducted from 2015 to 2017, under the leadership of Professor Akihiro Nakao, the network committee chairman of the 5th generation mobile network promotion forum (5GMF), major Japanese industry sector members jointly defined the requirements for 5G technologies by forming the Focus Group on IMT-2020 (FG IMT-2020) in the ITU-T. As a result, the Study Group 13 Q21 was established at the end of 2017, and a large number of Japanese companies are promoting standardization activities of network softwarization technologies, such as Software Defined Networking/Network Function Virtualizations in 5G at the ITU-T. As a result of the ITU-T’s recognition of these achievements, Professor Akihiro Nakao received a Certification of Appreciation, in addition to the International Activity Encouragement Award from the ITU Association of Japan in 2016. 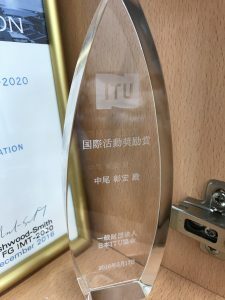 Since the 2017 fiscal year, the III has been making great contributions in standardizing telecommunications technologies in the ITU-T and 3GPP, especially in MIC funded projects such as the Japan-Europe collaboration project (collaboration among 10 enterprises and universities) and “R&D on Wired/Wireless Telecommunication Optimization for Increasing the Number of IoT Devices Through Effective Utilization of Radio Frequency Bands” (a partnership among 13 companies and universities).